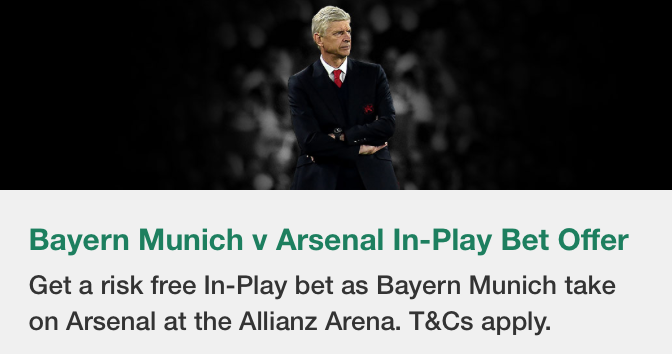 Get a risk free In-Play bet on Bayern Munich vs Arsenal game when you play a pre-match bet. No doubt plenty of you will be settling down in front of the TV with a beer in hand, if you're thinking about having a bet on this game then I highly recommended you check out Bet365's In-Play offer they're running on this game. If your in-play bet wins then you're quids in, literally. Bayern Munich had a bit of a wobble in November, but it's fair to say they are well and truly over that right now. The Bundesliga champions are undefeated in their last 11 competitive games and are in superb shape to win the league for the 27th time and for the 5th year in a row. They are the favourites to win this game and take an advantage back to the Emirates in the 2nd leg. Bayern Munich are undefeated in their last 11 competitive games. Real Madrid were the last team to beat Bayern at home in the Champions League, back in 2014. Bayern Munich have scored 2 or more goals in 12 of their last 14 Champions League home games. Robert Lewandowski has scored in all of Bayern's last four Champions League home games. Carlo Ancelotti is without Frank Ribery and Jerome Boateng tonight. Xabi Alonso is doubtful but is expected to play. Arsenal are 4th in the league, on joint points with Spurs. They are being hunted down for that spot by Liverpool and Man Utd and are in danger of missing out on a Champions League spot this season. Arsene Wenger's side haven't progressed past this round of the Champions League since the 2009/2010 season and face Bayern Munich for the 3rd time at this stage since then. Arsenal look shaky at the back, even though they defeated Hull at the weekend they were lucky to not fall behind in the early stages of that game. Arsenal were undefeated away from home in the group stages. But they failed to keep a clean sheet in those 3 games. Arsenal beat Bayern 2-0 at the Allianz Arena back in 2013 thanks to goals from Giroud and Koscielny. Mesut Ozil is Arsenal's top scorer in the Champions League this season with 4 goals. Cazorla, Ramsey, Perez and Debuchy are all missing for Arsenal tonight. Bayern and Arsenal have faced each other 10 times in the past with the Germans winning 5 and Arsenal winning 3. The 2 draws have both been score draws, 1-1 and 2-2. Arsenal would take either of those results tonight.